Víðgelmir is the largest of all caves in Iceland and one of the largest lava caves in the world. The cave has been protected since 1993. 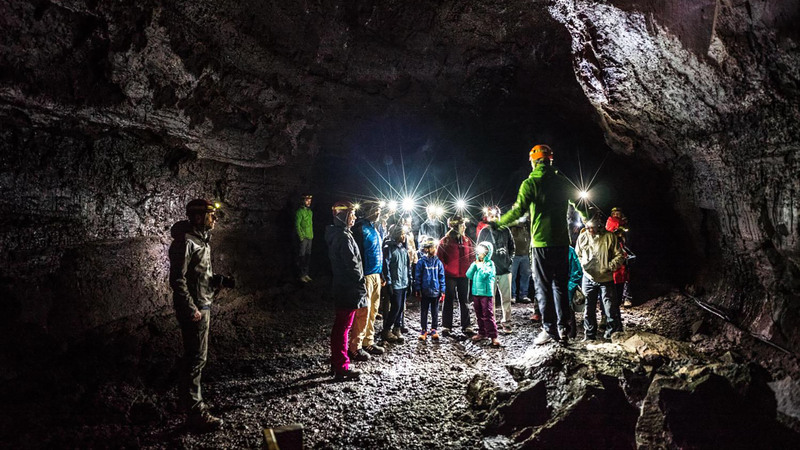 Víðgelmir is the largest lava caves in the world and offers "The Cave" two kinds of organised excursions into this colorful paradise. Cave Explorer takes about one and a half hours and Cave Master takes about 3-4 hours. Experience the wonders of Víðgelmir with "The Cave". The wonders of Víðgelmir for the whole family. The guided tour takes one and a half hour and takes you from one hall of the cave to another. The beauty of Víðgelmir is unprecedented with amazing colours and rock formations that will make this tour a unique experience. Please be aware that temperature inside the cave is low and it is recommended that all guests bring a warm jacket, hats and gloves. Age limit for the tour is 4 years old. Daily at 10 am, 11:30 am, 1 pm, 2:30 pm, 4 pm and 5:30 pm. Guests are required to show up 10–15 minutes before departure. Experience the grandeur of Víðgelmir in a guided tour that takes around 3–4 hours. Deep inside the cave are extremely well kept but delicate stalagmites, stalactites, and incredibly beautiful lava formations. Please be aware that temperature inside the cave is low and it is recommended that all guests bring a warm jacket, hats and gloves. Age limit for the tour is 9 years old. Minimum number of guests is 2.